Mariners Latest: Cust - Movin' On Up??? Cust - Movin' On Up??? In the last 9 games Jack Cust has been hitting the ball quite well going 11 for 35 with 4 walks. That equates to an .314 AVG and a .385 OBP which isn't half bad. 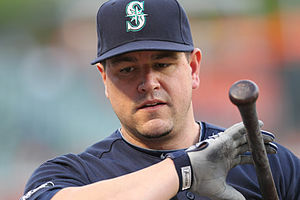 Although he still holds down the DH spot in the line-up that is generally reserved for power hitters in the American League. Five of Cust's past 11 hits have been doubles and a few of them have come just shy of going over the fence, for some reason they just won't go out. A couple of other deep fly balls to the gap at Safeco have been recorded as outs as well that would have definitely been HR's at other ballparks. So, the question is, "Is Jack Cust out of his slump?" Is the warmer weather warming up his bat? It's been proven that Cust always has a slow start, but to have no HR's at this point in the season and only 14 RBI as a DH is more than just a slow start. Even in his recent hitting escapade he only has three RBI in those 9 games. Obviously we all know that it's not Cust's fault that he's not hitting people in. They have to get on base when he gets up to the plate. Although there have been a number of opportunities with runners on as well, there still is a bright side to what we've seen from him lately. So, not everyone is going to see Cust's recent spark as enough to keep him on the club, or even near enough to be holding the DH spot hostage, but maybe this M's fan is starting to lean towards giving him a bit more time. Then again, in the last 39 at bats he has struck out 11 times while walking just 4. He's beginning to swing a bit more freely maybe, or maybe he's starting to lose any respect from opposing pitchers and therefor getting more pitches to hit, or watch go by. In conclusion, I don't know where I stand on the Jack Cust scenario. I can't stand that he's taking such a valuable position to do what he has been doing, but I sure am curious to see what he may do with more time. Then again, his career numbers aren't too much to write home about anyway. Off with him then - who else can we have as DH?? ?